Each business day many companies throw away a valuable corporate asset, the history of production. The PI System fully automates the collection, archiving and dissemination of this information. Process and plant data are the foundation of many business decisions. This information must be available to everyone, unfiltered and when needed. The PI System provides a fully automated package to collect, store, present and distribute plant data. Convenient and fast data access can significantly reduce the time required to make critical quality, cost, safety and environmental decisions. The direct access to validated and timely plant information also improves decision-making and performance. The PI System by OSI Software makes all this happen in a wide range of industries, every day. PI has the largest installed base of any Plant Information Management System. The PI System features an open client/server architecture that delivers data to the desktop, while preserving data security. The PI System Data Archive stores all the plant data on-line for years, and a wide variety of tools for exchanging data with other systems are supported. Whether you call it a Millwide Information System, a Refinery Information Management System, a Plantwide System, MES, or enterprise-wide computing, PI is an enterprise wise way to gain process knowledge; one that is remarkable easy to use, implement and manage. Hundreds of companies worldwide rely on the PI System for continuous improvement of plant performance, product quality and customer service. To replace a legacy system, build a new plant information system, or integrate a variety of process software applications, the PI System is the answer. The PI System's data analysis and graphical tools permit problems to be resolved faster, and often prevent small conditions from becoming major upsets. Many companies report that the data stored in PI allow them to improve their preventive maintenance programs, increasing equipment life. These uses result in increased production and lower operating costs. In addition, the PI System contributes to yield improvements and less waste. When the lab system sends messages to operations via the PI System, for example, the time required to change grades decreases, increasing production and minimizing waste. The time to respond to a quality problem is before the product goes out of spec. Applications such as the PI-Profiles package allow inconsistencies to be noticed and fixed before they become serious problems. Operators also appreciate the PI System because they can review operating conditions from previous runs, a valued feature when producing unusual or difficult product grades. The PI System provides an easy-to-use mechanism for obtaining and monitoring continuous process improvement. These programs frequently lead to improved product quality with no increases in production costs. With access to a PI System, customer service and quality assurance groups can quickly respond to customer complaints and concerns about product quality. This is because process data are stored at high resolution and remain on-line for extended periods of time. Personnel are also able to analyze past data to determine whether requests for new grades or product specs are feasible. And, because current data are also available, sales teams can review process conditions to determine when a new order can be scheduled or delivered. Less time is wasted trying to obtain data and information relating to a problem, so more time is available for solving it. Everyone throughout the facility uses a common set of data, eliminating discussions of whose data set is "right", again contributing to a more productive use of everyone's time. Also, applications developed internally with the PI System, such as performance monitoring and efficiency calculations may be shared between sites, reducing development time. Having one system containing all the process data from a facility makes it easier to comply with environmental, health and safety regulations. In addition, the calculations enable inferred values to be used in lieu of unreliable measurement points. PI System users are able to meet many of these ever changing requirements with a package that also helps them improve their process and lower their costs. The PI SystemTM is a client/server based software program designed to fully automate the collection, storage and presentation of manufacturing plant data. PI employs a flexible architecture that can be implemented in a variety of system configurations. The PI Data Server provides centralized collection of information, a real-time database and a historical data archive. PI client software packages put the maximum amount of information processing power possible in the hands of the user. These clients, which include PI-DataLinkTM and PI-ProcessBook®, allow the user to work in the familiar Microsoft® WindowsTM environment. Each PI System can interface to one or more real-time systems simultaneously and can read and write to virtually any real-time device or database. Integration tools, which include ActiveX controls, ODBC, and a large set of application programming interfaces, can be employed over the internet or in more traditional programming environments. Real-time and/or historical plant data can be displayed in PI-ProcessBook by creating process graphics, trends, statistical plots and tables. PI-ProcessBook is an ActiveX control container, features embedded Visual Basic for Applications (VBA) and is an ODBC container that enables users to easily combine data from PI and other databases on the same trend or display. PI-ProcessBook is an ideal platform for integration efforts. Data may be displayed in a variety of formats, including process graphics, trends, statistical plots, tables and charts. Displays are easy to configure and may be created in advance or built as desired. The same displays may be used for current or historical data, and may be accessed by anyone connected to the plant network via PCs or workstations. PI-DataLink provides an easy-to-use live link between the PI System and spreadsheets. The PI-DataLink add-in provides pull-down menu functions for accessing real-time or historical data. PI-DataLink is a popular way to create production reports and to analyze process data. Users do not need to login to the server and no special procedures are required. Add-in functions and dialogue boxes allow users to quickly access real time or historical data. Customers continue to use previously configured spreadsheets, but no longer need to input data or use complex data import procedures. PI-BatchView is a client application that allows PI customers to view data from a batch-oriented perspective. The PI-BatchView add-in to PI-ProcessBook supports trending data by batch; and the PI-DataLink add-in enables spreadsheet analysis by unit, product and Batch ID. PI-ActiveView brings your PI-ProcessBook applications to the web. 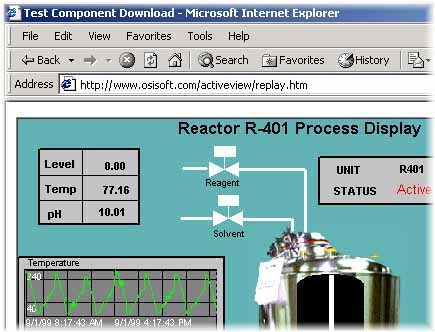 PI-ProcessBook displays run without modification because PI-ActiveView uses Microsoft's Visual Basic for Applications and can take advantage of embedded ActiveX controls. PI Systems are designed to accommodate very large real-time and historical databases, with every process point stored on-line for years, to very near its original resolution. Plant or corporate-wide PI Systems can employ multiple data archives. Data archives can be implemented in different system sizes ranging from 1,000 tags to over 100,000 tags. PI-ODBC makes the PI-Data Archive appear and act like a set of relational tables. PI-ODBC is frequently used to supply summary data such as Averages, Minimums, Maximums and Totals. Retrieval is very fast and the hazards of data duplication are eliminated. The data stored in PI can be generated by Distributed Control Systems (DCS), Programmable Logic Controllers (PLC), Lab Systems, SCADA Systems, via manual recording and by numerous other sources. Over 300 interfaces to common information systems are available to transfer data to and from PI. A single PI System can include many interfaces, permitting data from several control systems or process areas to be combined and available throughout the facility. Sigmafine has been licensed to over 100 sites worldwide. Many technologies and methods are required to properly generate a set of reconciled data for a process plant. The knowledge from development and installation process of previous Sigmafine sites is used for continuous improvement. An accurate source of information is essential to the profitability of a process plant. Plant data is the basis for any form of numerical analysis. With the increasing use of automation, operational data becomes much more accessible to the users. However, this data is commonly imperfect. It often shows little consistency between different process units. Missing product flows, unaccounted material losses and equipment down time, reflect gross metering errors. Sigmafine represents a new-generation Windows-based data reconciliation and yield accounting application. It allows the site to more accurately analyze the quality of flow and inventory measurements and produce a single consistent set of the most accurate reconciled data possible.